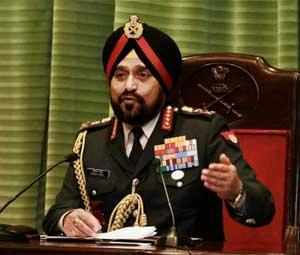 KHAIRAIR (UP): Rejecting Pakistan's allegations, Army chief General Bikram Singh on Wednesday said Indian troops have not crossed the Line of Control (LoC) or indulged in unprovoked firing and that any casualty on the other side may have been due to retaliatory firing. "Our jawans don't cross the LoC. We honour human rights. We fire in retaliation when provoked," he said here after meeting the family of Lance Naik Hemraj, who was beheaded by Pakistani soldiers in a cross-LoC attack in Poonch sector of Jammu and Kashmir on January 8. Responding to the Pakistani charge that one of its soldiers was killed in "unprovoked firing" along LoC, the Army chief said it may have happened during cross-firing. "These are normal activities that take place at the LoC. We have retaliated in response to cross-firing," he said. Replying to questions, Singh said, "The relationship (between the two countries) is got to be seen on what has been going on at the border". The Pakistan army had alleged that Indian troops had violated the ceasefire along LoC late last night and "carried out unprovoked firing" in Hotspring and Jandrot sectors. On the possibility of getting back the head of Hemraj, which was taken away by Pakistani soldiers, the Army chief said efforts are being made to get it back. Singh, however, refused to respond to Pakistani foreign minister Hina Rabbani Khar's statement that the Indian Army chief's comments were "provocative", saying he was yet to read the statement. He met the family of Hemraj and offered his condolences. He assured them that all their requirements will be met.